This exoplanet orbits the star Gliese 667 C, which belongs to a triple system. The six Earth-mass exoplanet circulates around its low-mass host star at a distance equal to only 1/20th of the Earth-Sun distance. The host star is a companion to two other low-mass stars, which are seen here in the distance. Astronomers announced today the discovery of 32 extrasolarplanets, some just five times the mass of Earth and others five timesheftier than giant Jupiter. The findings significantly boost the number of planets closer to Earth in size and help astronomers better understand what types ofstars birth what kinds of planets. The new alien planets, which bring the known count beyond 400,were found with the HARPSspectrograph on the European Southern Observatory's 3.6-m telescope in LaSilla, Chile. The HARPS (High Accuracy Radial Velocity Planet Searcher) programsurveyed about 2,000 stars over five years, with the particular aim of lookingat solar-type stars for low-mass planets. Most of the known exoplanets found previously are very large? typically many times the size of Jupiter ? so the newfound smaller planets bolsterthe known population of lower mass planets by 30 percent, said study teammember Xavier Bonfils of LAOG in Grenoble, France. It is not known if any of them are Earth-like, however,given the technology used to find them. The researchers look for dips instarlight to tell them that a planet has passed in front of the star. But they cannotsee the planet's surface or detect any potential atmosphere, importantconsiderations in determining whether or not a planet might be habitable. "It would be really difficult for HARPS to find a realEarth," said St?phane Udry of Geneva Observatory in Switzerland, who works with the discovery team. Several of the discovered planets are in multiple-planetsystems. The planets have orbital periods of anywhere from five Earth-days toseveral thousand days (Earth's orbit is 365 days). The survey also showed that, as models have predicted, solar-typestars have plenty of low-mass planets ? an intriguing finding in the searchfor other potential Earths out there. The HARPS data suggest that at least 40percent of solar-type stars have these smaller planets. "These low-mass planets are everywhere basically,"Udry said in a teleconference from a conference in Porto, Portugal. Among the worlds found were also several giant gas planets aroundmetal-poor stars. (Metals are any element heavier than hydrogen and helium, themain components of stars.) Such stars are thought to be less favorable for theformation of planets, which form in the metal-rich disc around young stars. The finding showed that "giant planets can still existaround metal-poor stars," said Nuno Santos of the University of Porto in Portugal. The survey also found four new exoplanets around M dwarfstars, which are relatively cool, low-mass stars. 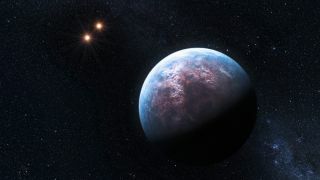 This finding challengesplanet formation theory, the researchers said, as current models suggest it isdifficult for planets to form around such stars. The new findings suggest that exoplanetsare quite common in our galaxy, the researchers said. Employing the adage that nature abhors a vacuum, Udry said, "ifthere is place to put a planet, it will put a planet there."